Please address questions about the curriculum to NBCA’s Director of Communications & Health Marketing, the Course Developer for this online curriculum, at lfullam@stoptheclot.org. The National Blood Clot Alliance developed and designed this curriculum with support provided by the Centers for Disease Control and Prevention under Cooperative Agreement 1U27DD001153. Atrial Fibrillation can lead to serious medical complications, including clot-provoked stroke. 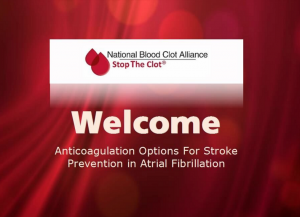 The National Blood Clot Alliance developed and designed this online learning module to help educate healthcare providers about anticoagulation options for stroke prevention in AF patients. Access the information here: AF Learning Module. Women & Blood Clots (This program includes a suite of resources, including fact sheets and a risk assessment tool for women making choices about birth control, as well as videos for patient viewing).